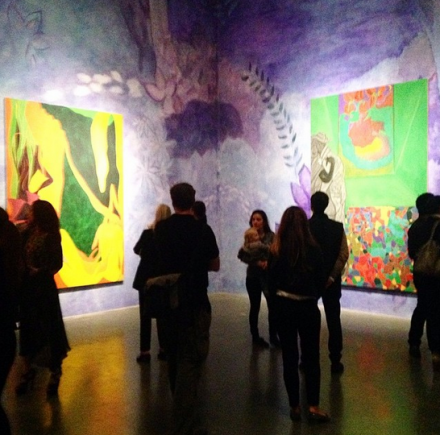 There’s a room on the third floor of Chris Ofili’s New Museum retrospective that offers a moment of crystallization for the rest of the exhibition. 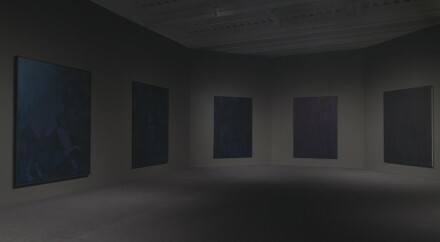 In a dimly lit chamber set back from the rest of the show, the artist has hung a set of works from his Blue Rider series, painted in rich blue hues that reveal various aspects based on the viewer’s position. 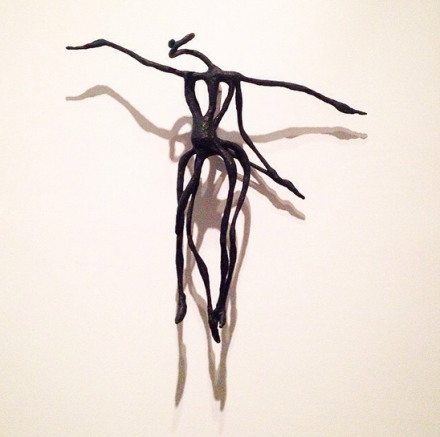 Sitting in the room for an extended period, recognizable, horrifying images slowly take form, present themselves, and slip back into the shadows: black bodies hanging from trees, unidentified hooded horsemen, and even an image of a black youth beaten by a series of police. Ofili’s work has long worked as a journalistic documentation of the African diaspora, borrowing cultural imagery from hip-hop, religious symbolism, Greek and African mythology and raw physical signifiers of the African continent (most notably chunks of Elephant dung). 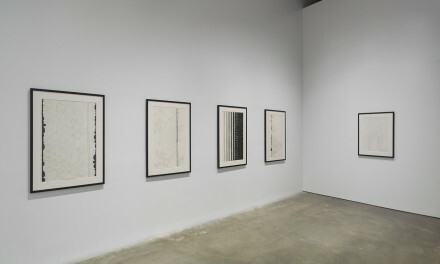 Tightly layered and meticulously rendered, his works often surge with vivid energies and challenging juxtapositions. 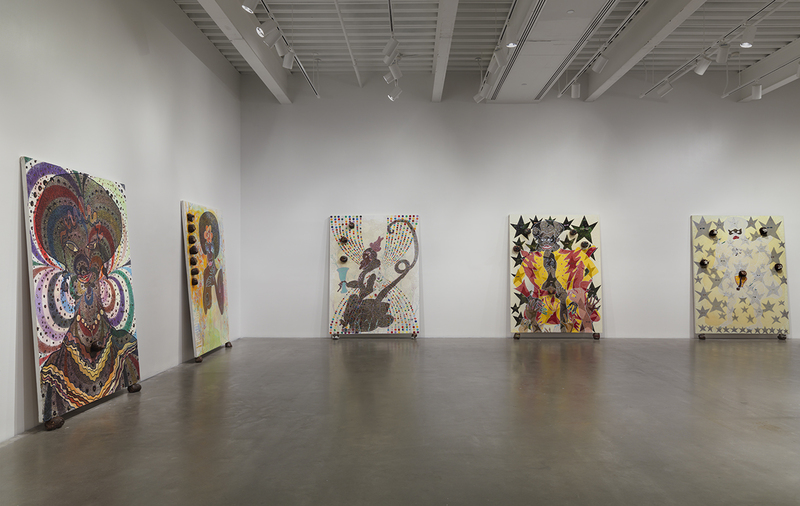 Greek gods, hip-hop stars and fertility idols are given a similar treatment in Ofili’s signature style, adorned with pointillist swirls and collaged elements that leave the canvases tied quite tightly between Ofili’s political agenda and the real world he seeks to document. Ofili’s early work, on view on the second floor, is perhaps the most charged with this sense of cultural fluidity. 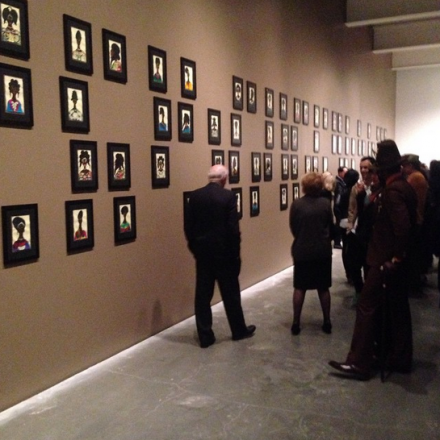 The show of works includes the artist’s The Holy Virgin Mary, depicting the Christian matriarch as a rugged African caricature, with one breast rendered from a chunk of elephant dung, and which prompted former Mayor Rudy Giuliani to threaten withdrawing funding from the Brooklyn Museum over a decade ago. 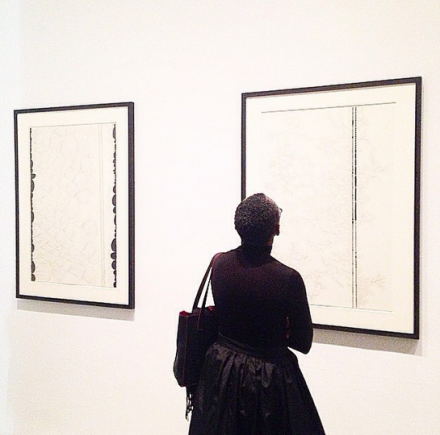 But shown alongside the rest of the works from Ofili’s early output, including fertility idols and immense reproductive organs, the work is returned to a more cohesive position within his practice. His Blue Rider series, located one floor up, in many ways, feels like a distillation of his most potent elements: curling, loose figurations that balance themselves out with the artist’s focus on surface texture. 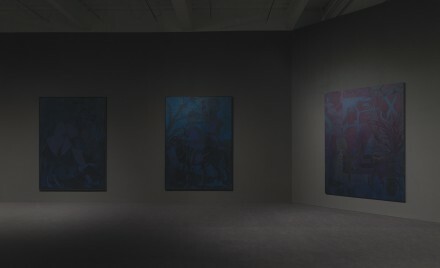 The act of seeing, of the visual narrative Ofili selects, is bound up in the surface of the work, gradually unfolding with each repeat viewing. Combining that stylistic awareness with his own potently political subject matter, the artist invites an moment of real consideration for his viewers. From this moment of historical trauma, Ofili’s exhibition seems to reach outwards in both directions, seeking for romantic notions of both the divine and the everyday. 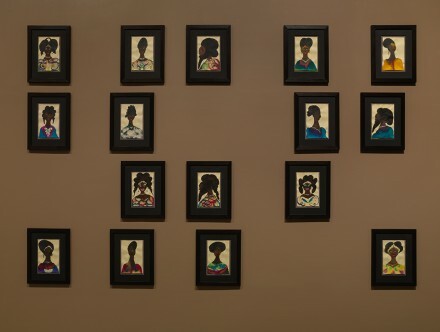 His previously mentioned early works allow a considered appreciation of the black experience and its particular blend of global religious and cultural iconographies, but the Fourth floor of the museum offers what could perhaps be seen as a cultural counterpoint. 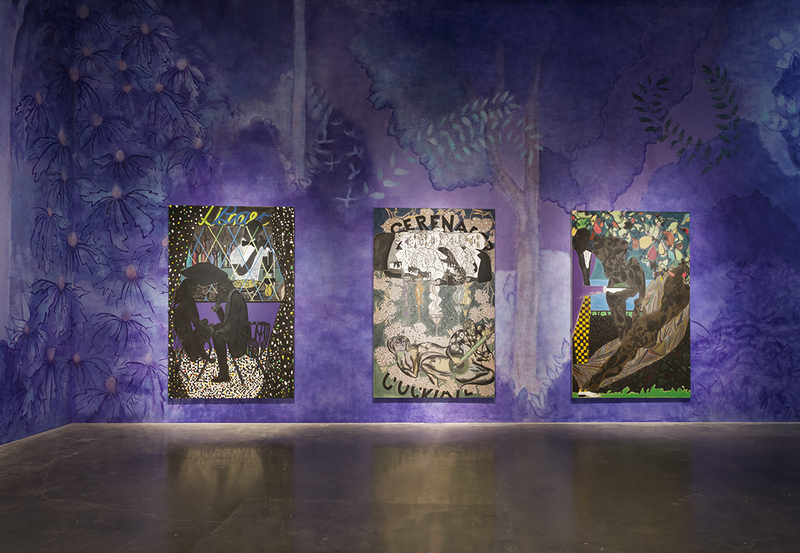 Through a series of vividly executed works, Ofili explores the landscapes and locations of his current home in Trinidad. Taking scenes from barrooms, dancehalls and local events, the works seem to take inspiration from the explorations of Paul Gaugin, returning these European painters’s explorations of the “exotic” to a more rooted, localized perspective. It’s this combination of influences and sources that ultimately makes Ofili’s work here so compelling. Taking the dialogues and techniques of the Western art canon, Ofili constantly negotiates and re-negotiates the encounters between Western history and the African cultures it has subjugated for centuries. 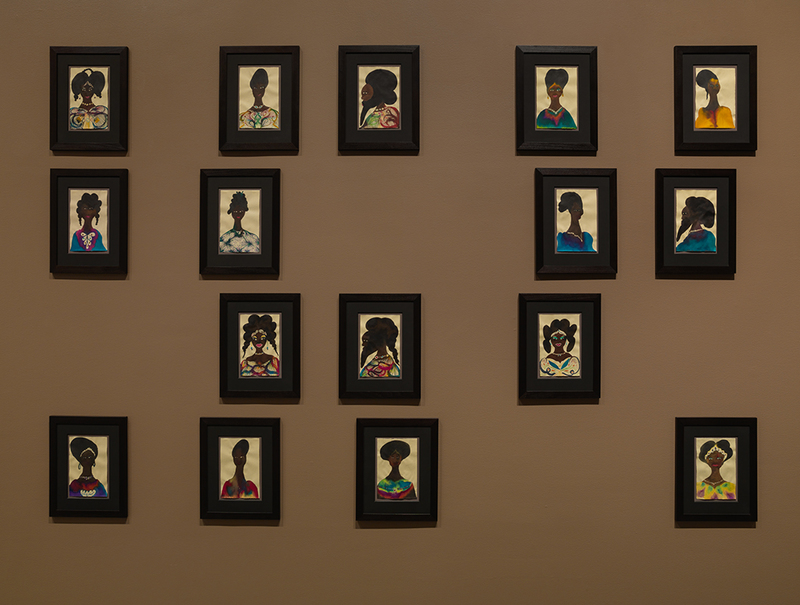 Exploring the intersection of their respective cultural signifiers and icons, the artist creates a striking map of black identity as it exists today. Ofili’s exhibition is on view through January 25th. This entry was posted on Wednesday, January 7th, 2015 at 12:00 am	and is filed under Art News. You can follow any responses to this entry through the RSS 2.0 feed. You can leave a response, or trackback from your own site.